GENERATIONS OF ACSIANS have thrived in the special environment of sound Christian and moral values, holistic education, and the ACS spirit of excellence, service and loyalty. Stating this, Bishop Dr Robert Solomon said the ACS (Anglo-Chinese School) brand of education is based on the biblical vision of holistic education – the education of the mind, heart and spirit. In biblical days, parents and elders were urged to teach and remind their children to love God with all their minds, heart and spirits (Dt. 6). ere was a close connection between education and spirituality. e fear of the Lord is the beginning of wisdom and knowledge (Prov. 1:7). 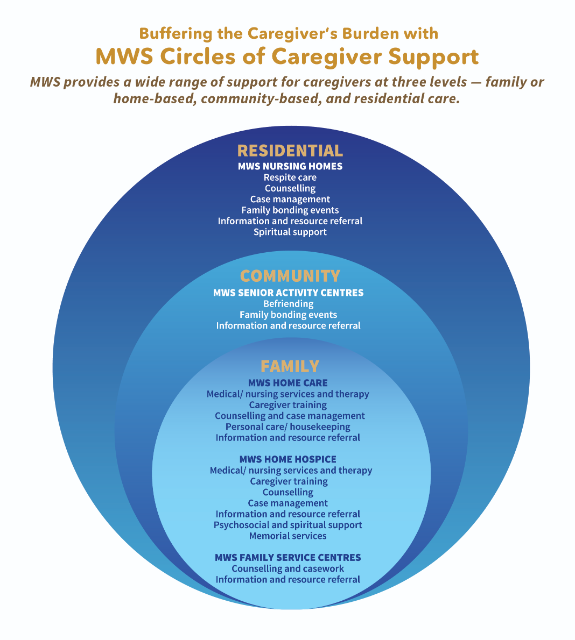 • Involves the proper education of the heart – relational skills are essential in ensuring that a student becomes a helpful and useful member of the community. “We are thus committed to continue providing the ACS brand of education to produce students with razor-sharp minds, kind and compassionate hearts, and godly and moral lives, people with an educated mind, heart and spirit. is task cannot be achieved by just a few idealistic and optimistic people. It is a task of the entire community. 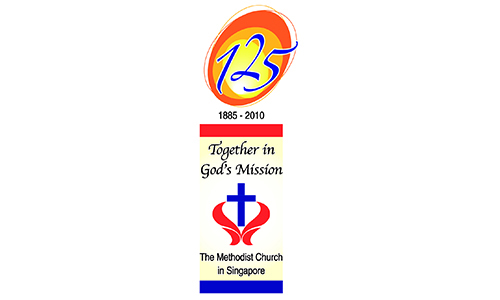 Bishop Dr Solomon was delivering his message at the ACS 125th Anniversary Combined Thanksgiving Service at the Singapore Indoor Stadium on March 1 – ACS Founder’s Day. 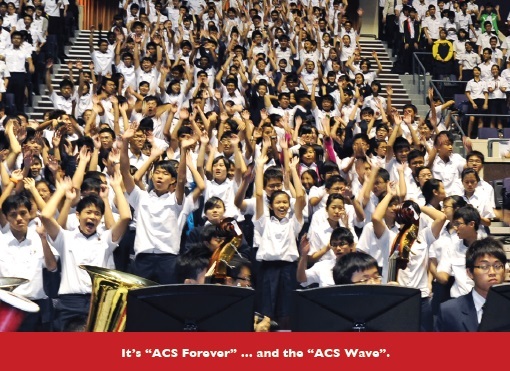 Present were more than 9,000 students, principals, teachers and alumni of the ACS Family of six schools – ACS (Junior), ACS (Primary), ACS (Barker Road), ACS (Independent), ACS (International) and Anglo- Chinese Junior College. There is a seventh school in Jakarta. 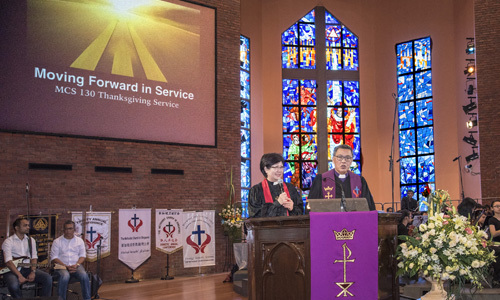 Basing the text of his sermon on Matthew 7:24-28, the Bishop told the gathering: “We must not only take care of our roots, but we must also ensure that we are fruitful, bearing much fruit that will bring glory to God and joy to people. I am speaking mainly of the kind of people that our schools produce. We must keep producing in greater measure people with sound character, superb competencies, and strong compassion for the poor and needy, people who will use who they are and what they know and are able to do, to serve God and others as a lifelong practice. “In its illustrious history, ACS has already shown this in a wonderful way. We must continue to do this, in ever increasing measure. Our world is changing rapidly, and with it we meet a growing number of challenges in all spheres of life. Our holistic education will go a long way in ensuring that our students will be prepared to adapt, innovate and tackle the challenges in a way that will draw from resources deep within our heritage, as well as respond effectively to our constantly changing environment. 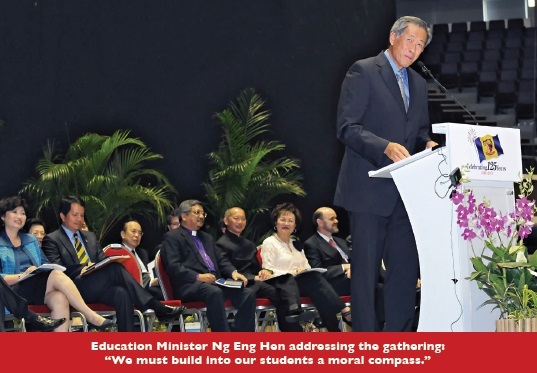 Earlier, the Guest-of- Honour, Dr Ng Eng Hen, Minister for Education and Second Minister for Defence, noted that “what started out as a vision, a prayer and a hope in 1886 with humble beginnings in a shophouse at Amoy Street with just 13 pupils has proliferated into a stable of remarkable institutions that have produced generations of leaders across the broad spectrum of arts, sports, business, science, academia and Government. They are too numerous to name”. He also noted that many alumni had followed the example of ACS’ founder, Bishop William Oldham, to serve people and improve society. ACS has excelled in various fi elds of endeavour, led by men and women who embodied the ACS spirit of giving and serving the school and the community. 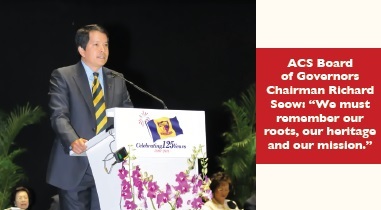 Looking ahead, Dr Ng, who is an ACSian, said ACS must continue to do what it does best – build men and women of character, who excel and serve to improve themselves and the lives of those around them, build men and women who will respond to a higher calling and challenge. The ACS schools must also continue to emphasise community service. This is important, especially for ACS students because in the minds of many Singaporeans, ACS is seen as the school for the privileged, even the elite. Thirdly, the ACS education must produce independent learners but who know what and why they believe. In today’s modern society, the challenge is too much information from diverse sources. Said Dr Ng: “In that context, we must build into our students a moral compass which equips them to test a surfeit of ideas and lifestyles. The stadium roared to life when the six principals sang the inspirational song, “You Raise Me Up”. As each of them took turns to sing a line, their respective students cheered them on and sang along with great gusto. 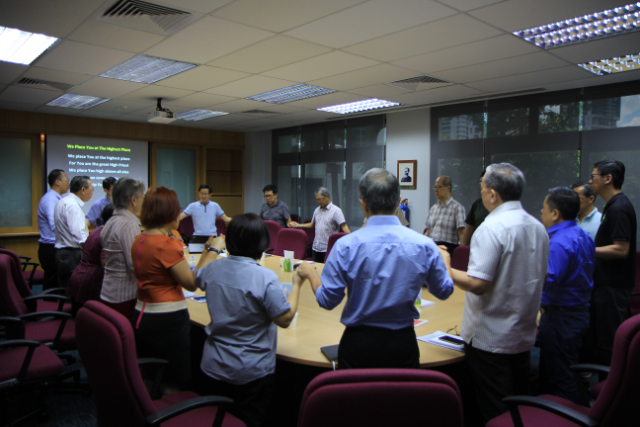 It was their special item of “Song of Praise and Unity” just before Dr Ng rose to speak. THE ACS FAMILY of six schools commemorated its 125th Anniversary with the setting up of the Anglo-Chinese Schools Foundation, an approved charity. He said money raised for the foundation would also create more scholarships for the needy students. 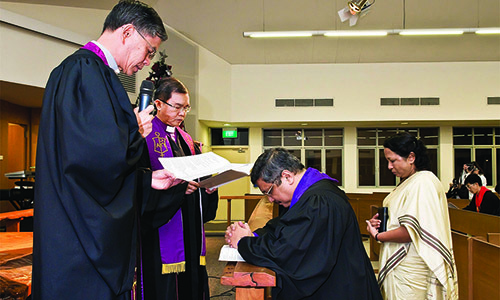 ACS’ founder, Bishop William Oldham; the Church for its unstinting support, guidance and prayers throughout our history; Singapore’s leaders who have made education a priority and fostered an environment that has allowed the ACS brand of education to grow and flourish; the ACS benefactors; the principals past and present and teachers and staﬀ past and present; generations of dedicated governors, OBA committee members, parents, Old Boys and Girls who have each played their significant role – sometimes recognised but often not – in building ACS into the One ACS that it has become today. “We must remember our roots, our heritage and our mission. Our growth and success have created a very strong tie that binds us in the ACS Family but it is also an important tie that binds us as a community, as a people and as a nation.